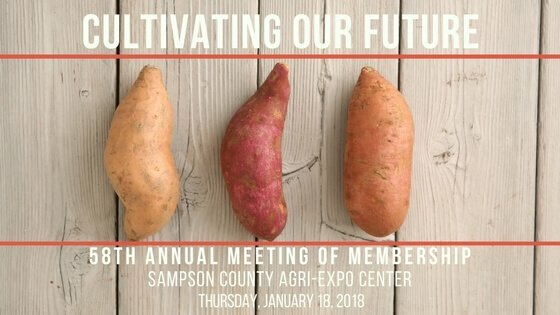 We have begun planning for the North Carolina SweetPotato Commission’s 2018 Annual Meeting of Membership. As always, our meeting is held on the third Thursday in January. This year we will meet at the Sampson County Agri-Expo Center in Clinton, NC on January 18, 2018. We would be honored if you would consider exhibiting at our trade show. Please click here for the Exhibitor Application. Load-in is available on Wednesday for early set-up, if you choose. On Thursday, our doors will open to the public at 8am, with the meeting beginning at 10am. Continental breakfast and buffet lunch will be served. For sponsorship, please click here for the Sponsor Advertising Form. Trying to Register for this event and cannot find the Sponsorship Form. Can you email me one?